Joe Joyce stopped Ian Lewison as he made an impressive start to life as a professional in the main event of the inaugural Hayemaker Ringstar Fight Night — live on free-to-air entertainment channel Dave. Fellow Hayemaker Ringstar debutants Michael ‘Venom’ Page and Willy Hutchinson also produced dazzling displays to record victories in front of a packed house at London’s Indigo at The O2. Tipped by promoter David Haye as “the future of the heavyweight division”, Joyce confidently took care of Lewison in a tough assignment for the novice pro. 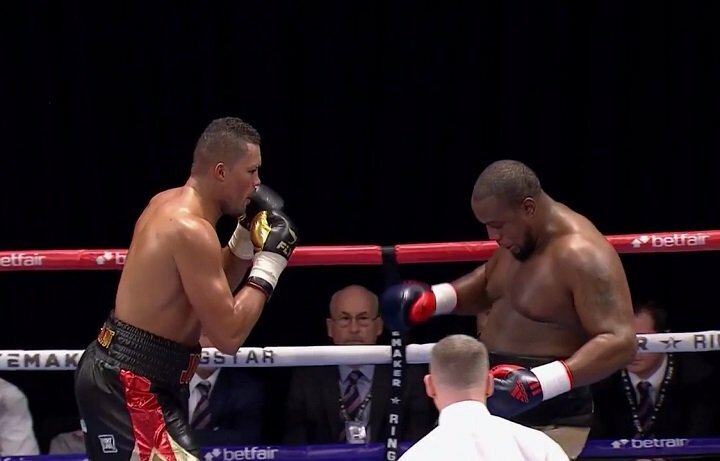 Lewison, retired by his corner after 10 rounds while battling Dillian Whyte for the vacant British heavyweight title last October, came out swinging but Joyce marched through whatever was thrown at him. The Olympic silver medallist stepped on the gas in the third round as Lewison began to tire, pinning him in the corner and against the ropes behind a ramrod left jab. Lewison, 36, was troubled in the fourth by a problem with his right eye, which he kept dabbing at. Joyce refused to rush and continued to pick his punches before his opponent’s shorts had to be pulled up — not for the first time — by ref Bob Williams. Trainer Don Charles checked Lewison’s vision and the ringside doctor also inspected his eye before the fifth stanza began. Joyce continued to control the action until a heavy left in the eighth caused his fellow Londoner to wilt. With Lewison under heavy fire, his corner threw in the towel and the contest was waved off after two minutes and 35 seconds of the round. The victorious debutant, 32, said: “It’s really good to get the first one out of the way. Respect to Lewison — he’s a tough opponent. Haye added: “Believe me, tonight was only 30-40 per cent of what I know he has. Not many heavyweights could grind down and stop an opponent like Lewison. Switching from MMA to the sweet science, Bellator superstar Page, 30, took care of Jonathan Castano inside the four-round distance. Boxing at light-heavyweight, the 10-time world kickboxing champion displayed his unconventional style as he cruised through the opening two rounds, before putting his 33-year-old opponent down in the third with a powerful right hand. Castano beat the count but Williams waved off the fight with the Spaniard in no state to continue — despite his protests to the contrary. A delighted MVP said: “I loved every second. I felt absolutely fantastic and it was a good tester. “I was looking for that finishing punch throughout the fight. I needed to bring him out of his cage and I caught him very well at the end. Haye added: “I thought the performance was perfect. He was throwing some crazy punches from crazy angles. It was pure entertainment and that’s what we need in boxing. Scottish amateur star Hutchinson also looked immediately at home as he made his professional bow against Hungary’s Attila Tibor Nagy. The 19-year-old flew out of the blocks and maintained a blistering attack until referee Lee Every stopped the contest after one minute and 29 seconds of the opening round. Goodwin Boxing’s Tunji Ogunniya, 35, kicked off the night with a 40-36 points victory over Teodor Nikolov — extending his unbeaten record to three fights. Duane Sinclair, 35, also preserved his undefeated streak courtesy of an impressive first-round stoppage of Croatia’s Mislav Milardovic. Light-heavyweight Sinclair, a close friend of rising star Joshua Buatsi, now boasts seven wins from seven pro outings. Kent fighter Jordan Dennis dropped Darren Snow in the third round with a stinging body shot on his way to a 40-34 points victory. The 26-year-old, who turned pro last year, moves to 3-0. Adi Burden stopped Georgi Valevski in the final session of their four-rounder, before fellow unbeaten 22-year-old Tom Ansell kept the momentum rolling for the Goodwin stable by ending an entertaining tear-up with Aleksandar Chukaleyski in the second. After being KO’d in his last outing, cruiserweight Nick Parpa outpointed Jindrich Velecky 40-36, while Luke Robinson edged a close contest against Robert Studzinski 39-38. The inaugural Fight Night marked the beginning of a three-year deal between Hayemaker Ringstar and UKTV, delivering five boxing shows per year. Hayemaker Ringstar, a joint venture between Haye’s Hayemaker Promotions and renowned boxing promoter Richard Schaefer, aims to be recognised as the home of world champions and future world champions. Catch up on Hayemaker Ringstar Fight Night on UKTV Play.